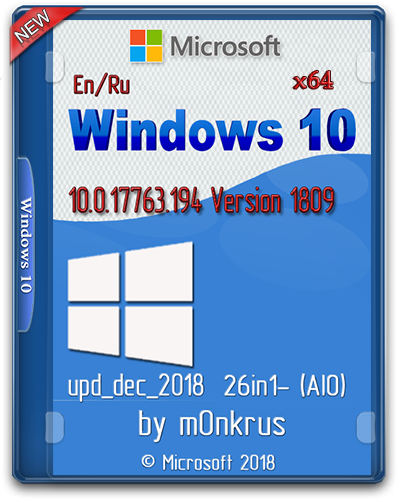 This assembly is the successor of the Windows 10 (v1803) RUS-ENG x64 -26in1- (AIO) assembly and is designed for those who have a license or want to use some other method of activation preferred by him personally. The assembly is created on the basis of official distributions and contains minor modifications that mostly affect not the installed product, but only the installation process. – The build is based on Windows 10 distributions published on MSDN on the eleventh of December 2018. – This assembly does not include anything that would make it possible to register and activate the operating systems included in it. All such procedures are carried out only by third-party means. – The Microsoft Diagnostics and Recovery Toolset (MSDaRT) 10 module is integrated into the system recovery service, both launched from the installation media and built into the system itself, which significantly expands the possibilities for system resuscitation. – Fixed the Windows Installer 10 feature, due to which in the multilingual build, when running the installation from under an existing system, there was no choice of language for the installer interface. In this assembly, the interface language is determined automatically based on the language of the running OS. – After the installation is completed, you will be able to switch the interface language from Russian to English and back using standard Windows 10 tools (except for the Home Single Language edition). – A script has been added to the Home Single Language editors, which allows you to switch the interface language from Russian to English and back without losing the license. – Restored functionality of the boot menu by pressing F8 when you start the computer. – When you start installing Windows 10 from under an existing system with an English interface, the point of transferring applications from the old system to the new one will be blocked. Only personal files can be transferred. Moreover, the default language of the installed system will be Russian. It can be switched to English after installation. – Made minor improvements to the installer interface, fixing the flaws of Microsoft programmers.